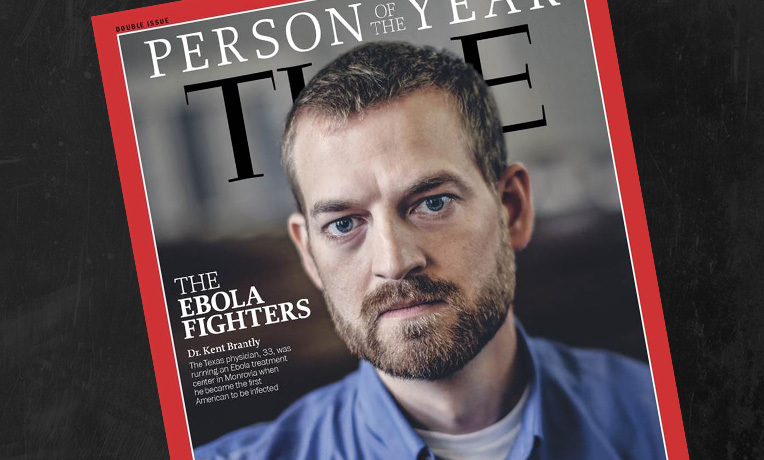 Kent Brantly, the Samaritan’s Purse doctor who contracted and survived the deadly Ebola virus while caring for people stricken with the disease in Liberia this summer, is one of a courageous group selected as Time magazine’s 2014 Person of the Year. The magazine said the title goes to an individual or group who, for better or worse, has had the biggest impact on the world and the news over the course of the previous year. To date there have been more than 17,000 Ebola cases in this outbreak, leading to more than 6,000 deaths. Dr. Brantly was treating victims of the disease at the Samaritan’s Purse case management center at ELWA Hospital near Monrovia when he contracted Ebola in late July. He received a dose of an experimental serum while in critical condition in Liberia and was then transported to Emory Hospital in Atlanta. “I’m thankful to be here, thankful to be with my family, and thankful for the opportunity to speak out for people who are still suffering in West Africa,” he said. Samaritan’s Purse continues to battle the disease in Liberia. We are deploying small teams of courageous staff to train locals and provide them with the materials they need to stop the spread of the deadly disease in their villages. We recently opened the first Ebola Community Care Center in southeast Liberia. Although the virus is slowing in Liberia’s capital, smaller outbreaks are increasing in rural areas. The need is still great.